Online bookings are no longer available, please call our Reservations team on: 020 7734 4888 to book your place. 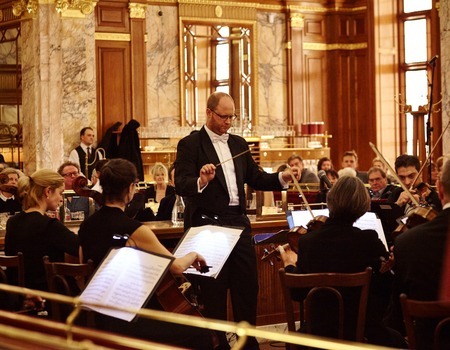 On Sunday 13 May from 6.30pm, Brasserie Zédel is thrilled to welcome the return of the world-class Philharmonia Orchestra. Following the overwhelming success of our previous two classical concerts, expect an unforgettable evening as one of the UK's most celebrated musical ensembles perform in our own intimate setting. Taking centre stage in the dining room, the 20-player ensemble will this time delight diners with the likes of Mozart and Debussy before performing familiar melodies from classic French films such as Amélie, Moulin Rouge and Chocolat. An exclusive three-course meal will be served throughout the evening, including a choice of traditional French dishes such as 'Salade d'Endives au Roquefort', 'Magret de Canard aux Légumes de Printemps' and 'Ile Flottante'. £85 per person (includes an exclusive three-course meal, a glass of Pommery Champagne, a glass of house wine, coffee and mineral water). £20 per person (includes stage seating only). £10 per ticket (includes standing at the bar only). - Bookings must be made in advance. - Bookings are allocated on a first come first served basis. - All guests must be seated by 7.45pm at the latest. Please note the doors will close after this. - Each £85 ticket includes a three-course meal, glass of champagne, glass of house wine, coffee and mineral water (exclusive of service charge). All other drinks will need to be ordered and paid for separately with service chargeable. - All £20 and £10 tickets are for entry only. Anything ordered from the bar will need to be paid for separately with service chargeable. - Alcohol will only be served to over 18s. - Please note that a few tables have restricted views of the Orchestra.